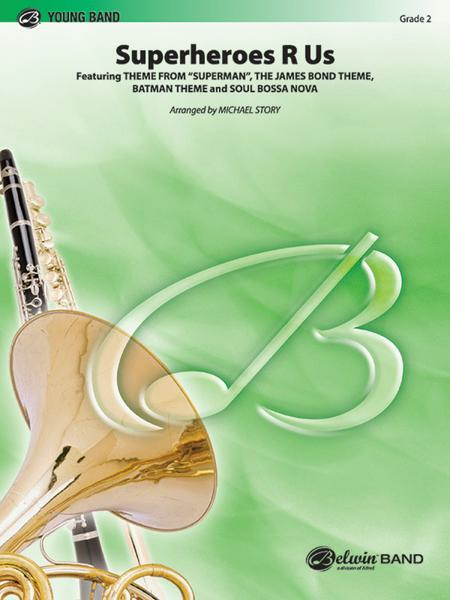 Featuring: Superman / James Bond Theme / Batman Theme / Soul Bossa Nova from Austin Powers. Arranged by Michael Story. Concert Band; Performance Music Ensemble; Single Titles; SmartMusic. Pop Young Band. Form: Medley. Light Concert; Movie. Part(s); Score. 175 pages. Alfred Music #00-26738. Published by Alfred Music (AP.26738). 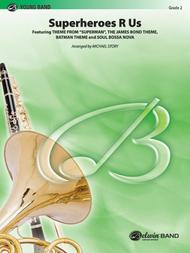 An excellent arrangement of themes, at an easy/playable level for young bands. Highly recommended and lots of fun! /8 so if you want to teach meter, have a plan ready. The Bossa Nova was also another great teaching opportunity for style. Don't let the grammar of the "R" fool you. It's great. Im in the seventh grade at Forest middle and our director picked this out for us and its great~he thinks tuba sounds weird so he changed it a bit~ Great song, get it you wont be disappointed. I"m in 7th grade and our band director bought this peice for the band. It is a very good peice and sounds great!